Confession: We have been a little worried our 2.5 year old is color blind. I do not mean that offensively to anyone who is color blind or jokingly. We were seriously worried about her lack of color understanding. Somewhat frustrating since she loves all things rainbow. What color is this cup? No, it’s not blue. Try again. What color is this cup? No, it’s not green. Try again. What color is it? White! No, Purple! PURPLE cup! No, baby girl. It’s RED. It is a RED cup. Red like a fire engine. Y’all. We just could not understand. And this was becoming a regular thing. She’d excitedly yell in the car, “Look Mom! A RED car! A RED car!” I’d look and the car would be BLUE. What in the world? For the life of me, I do not remember colors being this difficult to teach my first born. But, for whatever reason, it was just not clicking. Then, it came time to set up her preschool meeting and assessment (yes, that is an actual thing). So, I did what any former teaching book loving mom would do. I panicked and ordered several books about colors on Amazon (as if we didn’t already own color books, cards, toys, puzzles, etc.) But, lo and behold, she is starting to get it. Her preschool assessment is today, and she can proudly identify both PURPLE and GREEN correctly 95% of the time. We are on a roll. Therefore, I am presenting the books we’ve been using that have somehow made sense to her little brain. 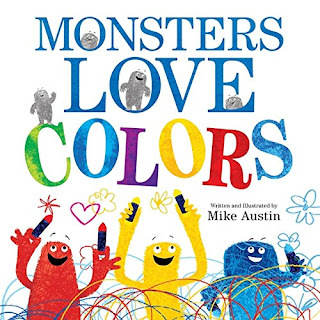 This children’s book by Mike Austin is fantastic! Both of my kids are always fans of anything to do with monsters. This book combines monsters, silly sounding words and lots of onomatopoeia with bright illustrations and squiggles. It teaches children about the different colors using different colored monsters by emphasizing fun color words (Yellow = Roar! ), as well as teaching them how mixing certain colors makes new colors. It is fun to read (even for adults) and kids will giggle and learn at the same time. Win, win! My daughter is also in the train stage. Trains are just so much fun to toddlers and preschoolers. Who knew? 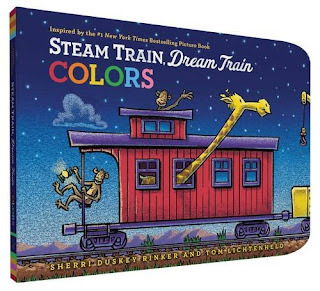 Well, clearly Sherri Duskey Rinker did when she created the bestselling book Steam Train Dream Train. I tend to find most book spin-offs as simply ploys to get more money. However, in this case, the book stands alone well. It is just as fun and uses smart tools to teach colors. Each page focuses on a different solid color with the corresponding page full of things that are that same color. The solid colored page includes lines that rhyme and have rhythm making it enjoyable as a read aloud. If you do not have a Matthew Van Fleet book on your bookshelf, you must change that today! Van Fleet’s books are, by far, my children’s most read and most adored books. 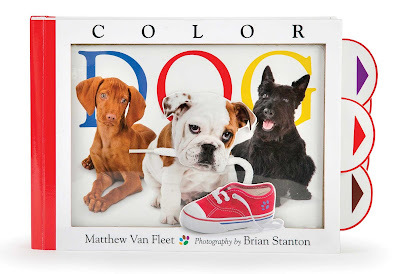 In this touch, feel, pull the tab, moveable scene book (yes, these books really have it all), dogs help introduce the concept of color. Tons of dogs are used to create colorful pictures. My kids laugh aloud as they see a dog pass stinky green gas on one page. What can I say? We have a very sophisticated sense of humor in our home. But, with all the interactive touch and pull features, it is effective in teaching concepts. This is simply a basic word book with colored pictures, but sometimes the basic books work the best. In this particular book, there are tabbed pages for each color of the rainbow. Each page is full of items that are the key color. So, your child will both learn about colors and increase his/her vocabulary. Another perk to this book is that anyone can use it to teach colors. For example, my 6 year has been using it to teacher his little sister colors. We love the Bear series (Bear Snores On) in our home. Karma Wilson and Jane Chapman have created a bear that children love because he is humble and kind and friends with all the animals. 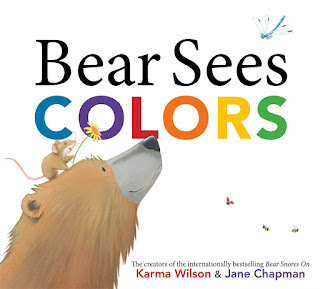 In this book, Bear is learning about all the different colors in the world around him. Readers take a walk with Bear through the woods and play spy the different colors with Bear. 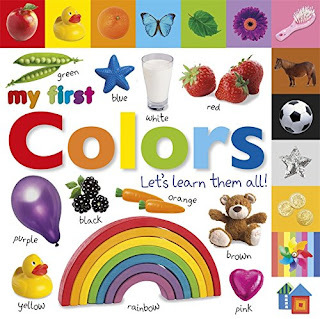 Since kids love to play I spy, this is a great book to use to point out colors. * You may order these book from amazon. This blog has affiliate links. Thank you for supporting my blog!